M8RX is a tone grid that plays the sequence from left to right as a pattern. Touched pads illuminate and trigger a tone based on its position in the grid relative to the scale and key. 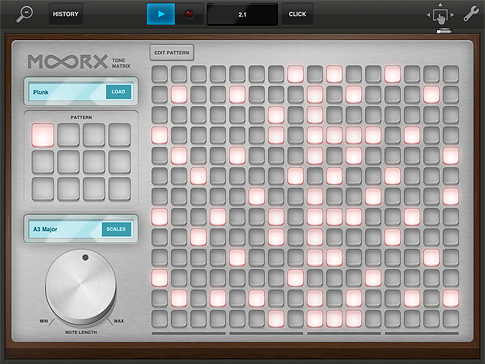 M8RX is polyphonic, so you can select more than one tone for any step of the pattern. Use M8RX’s pattern banks and parameters to maximize variety and flexibility. 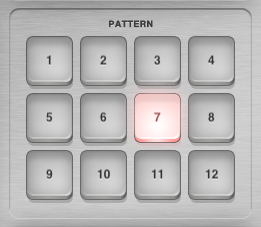 M8RX’s pattern selector includes 12 unique patterns which can each have their own notes. This includes which grid buttons are selected and the scale, key, octave. When you tap to change a pattern, the M8RX will wait until the end of the currently playing pattern is reached before changing. 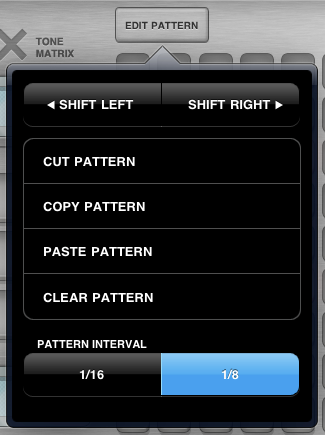 You can automate pattern changes by pressing record in the transport. The pattern Selector also obeys loop/table write mode like other parameters, allowing you to easily assign a pattern to a Triggerator Loop (See T101-Triggerator in this guide). Any M8RX pattern can be shifted left or right, cut, copied, pasted or cleared. Change the note length from 1/8 to 1/16 to double the speed of the pattern playback. M8RX playback uses instrument sample libraries. To change the instrument, tap LOAD on the instrument LCD display and select from the available list. M8RX’s Scales define the tonal range of the grid. Tap the SCALES button to change the scale, key or octave. The key determines the grid baseline; if C is selected, the bottom row of the grid begins with that tone. The octave also determines where the grid starts tonally; the higher the octave setting, the higher the pitch of the grid. There are five built-in scales to make the grid easily playable. Choosing a scale eliminates tones that are not part of the scale, and the grid extends higher in notes within the given scale. The Chromatic scale includes all half-steps of a particular key for one full octave. 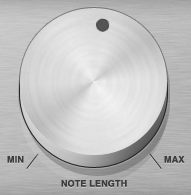 Turn down the note length dial to cut the sound very short for a staccato effect. Turn the dial all the way up for the sound to play in full.